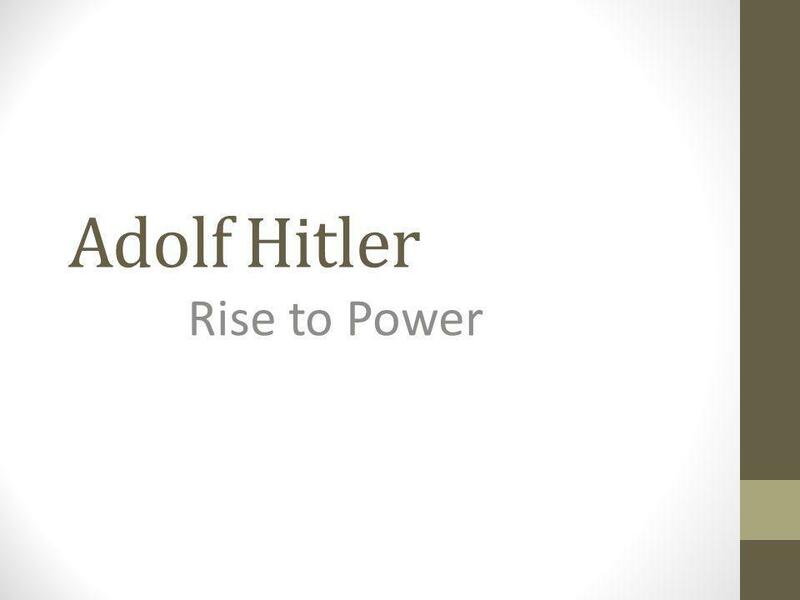 Adolf Hitler Rise to Power. Czechoslovakia was German speaking and wealthy. 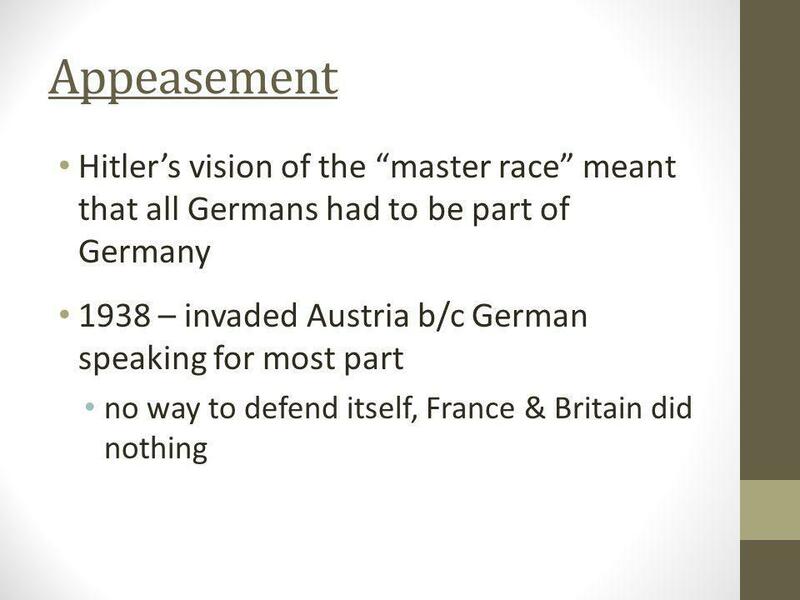 Hitler claimed they were oppressed and threatened to occupy the area France, Britain and Russia promised to stand by the Czechs and met with Germany & Italy Gave in to Germany in order to avoid another war Germany took over the entire area Germany next demanded Poland, Britain and France said they would protect Poland USSR made a deal with Germany to not fight against each other and split Poland between them With Russia out of the way, Hitler was ready to go Q. 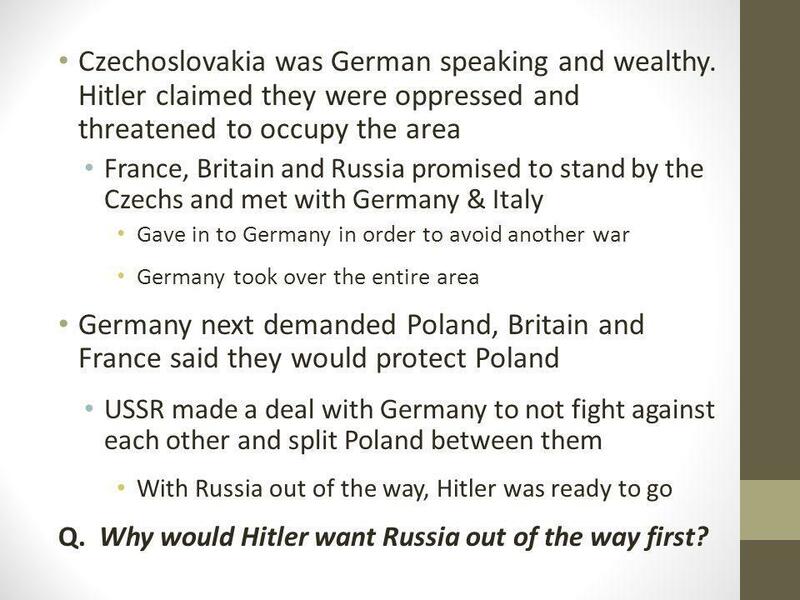 Why would Hitler want Russia out of the way first? 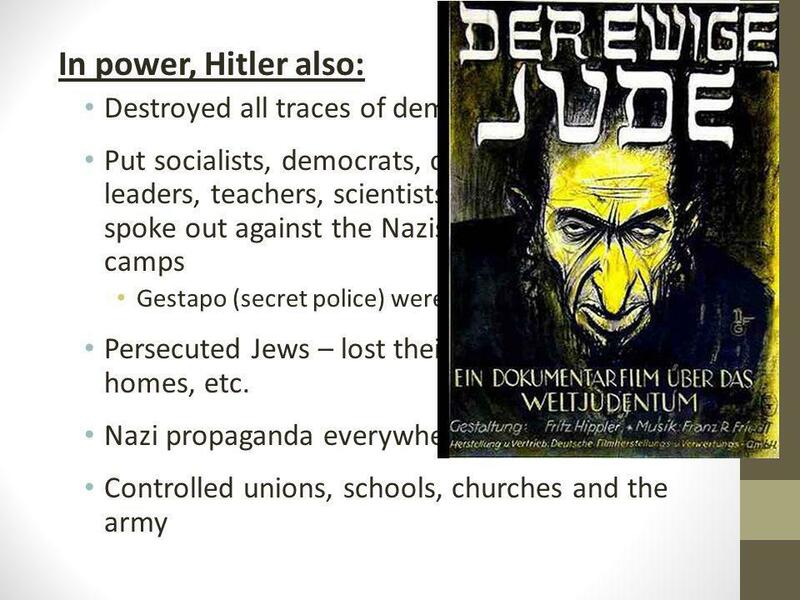 Download ppt "Adolf Hitler Rise to Power." 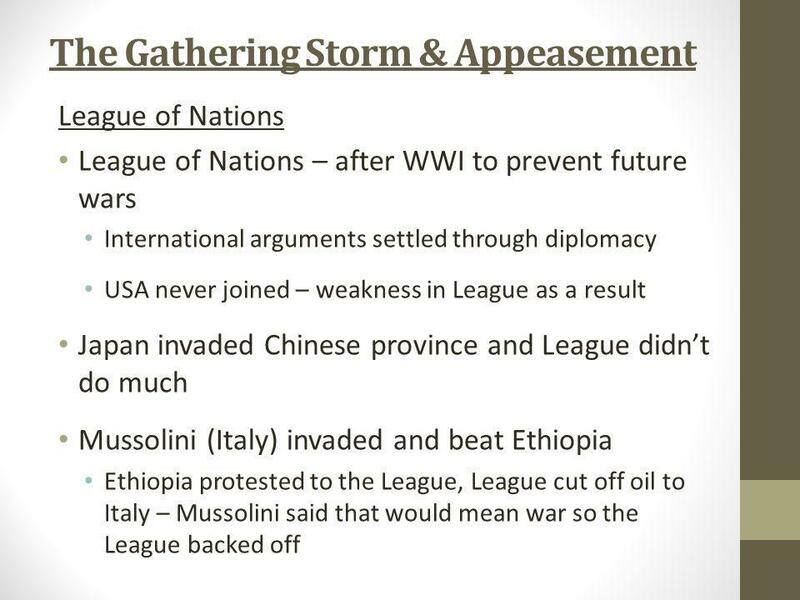 GRADE 10 CANADIAN HISTORY MS. MAHARAJ Leading up to WW2: The 1930’s. 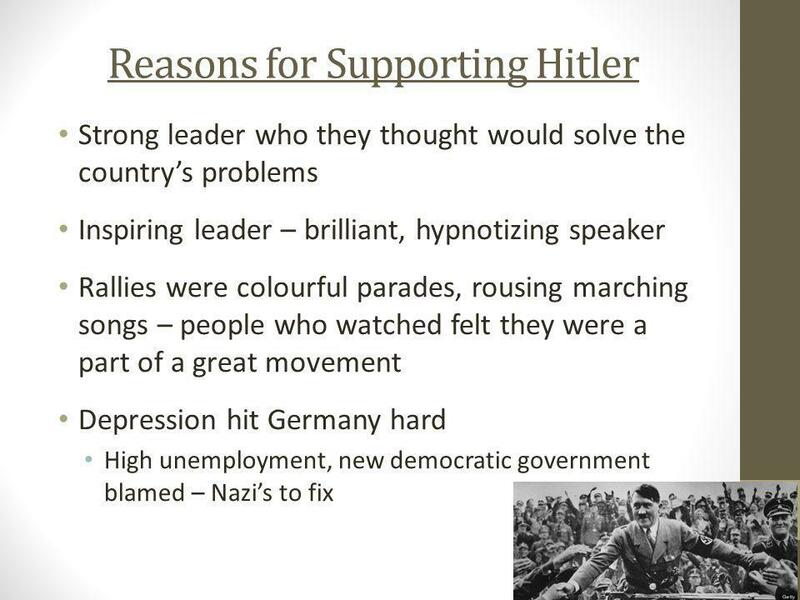 15-3b Nazism and Adolf Hitler. 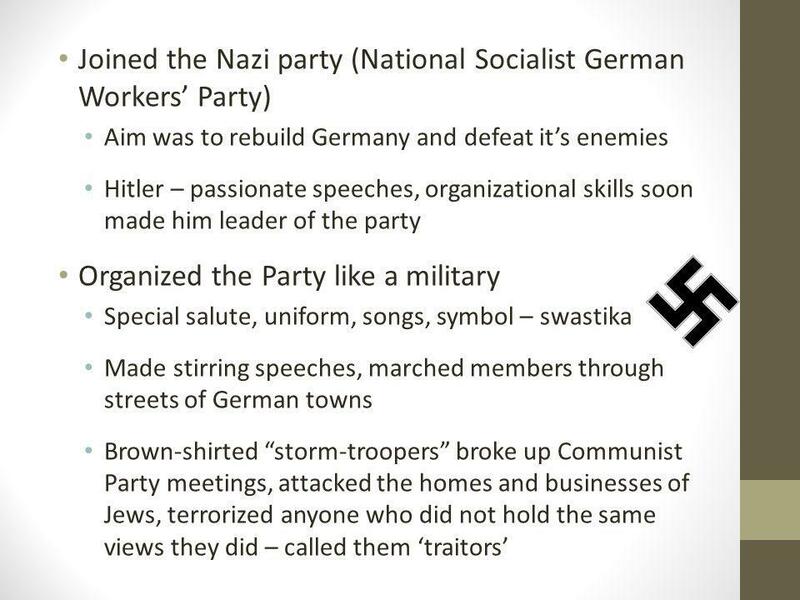 The Rise of Adolph Hitler How a Monster Won Over a Nation. 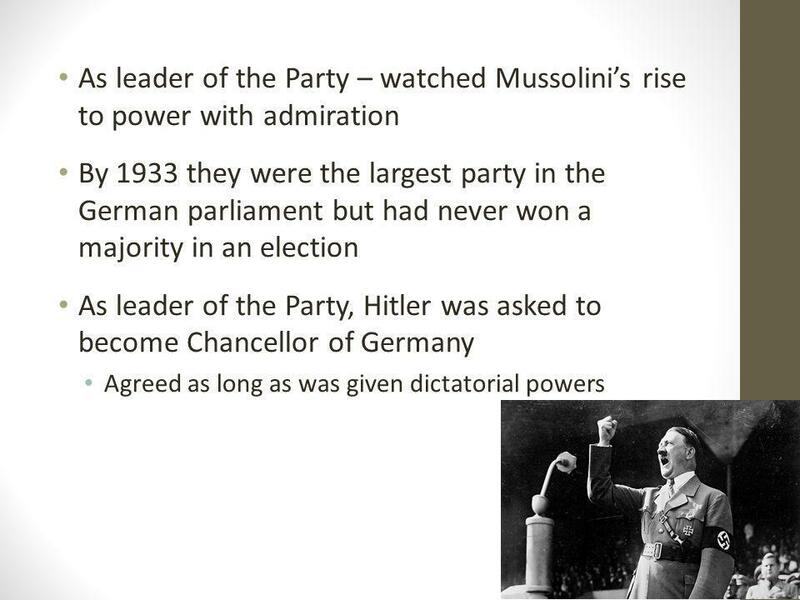 European Dictators Adolf Hitler Benito Mussolini Joseph Stalin. 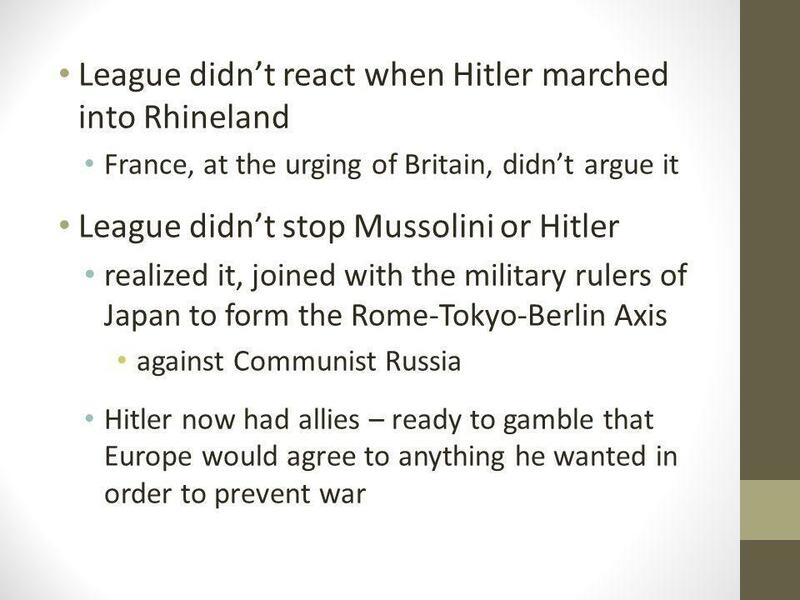 The War in Europe The Treaty of Versailles Formally ended WWI Imposed harsh terms on Germany – Lost land – Limited military Angered many Germans. 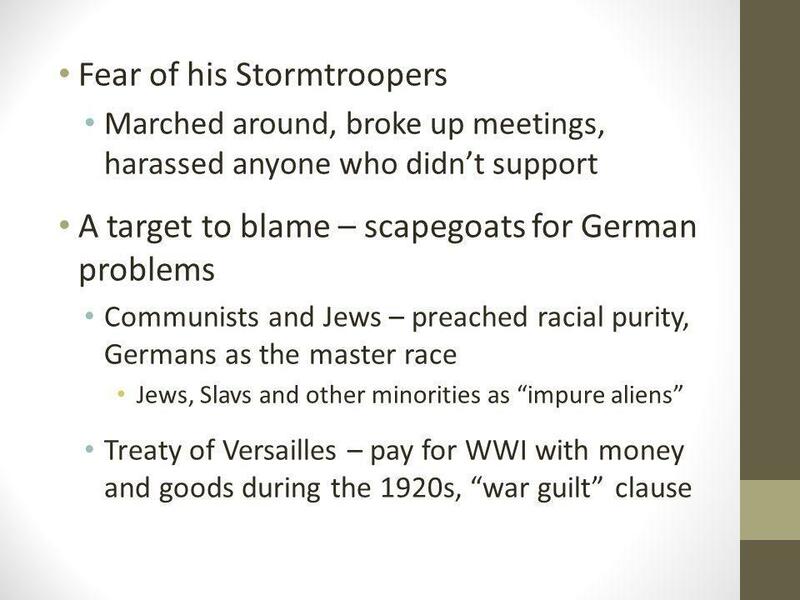 RISE OF NAZISM Germany faced many problems after WWI. * * lost lands that contained valuable natural resources. 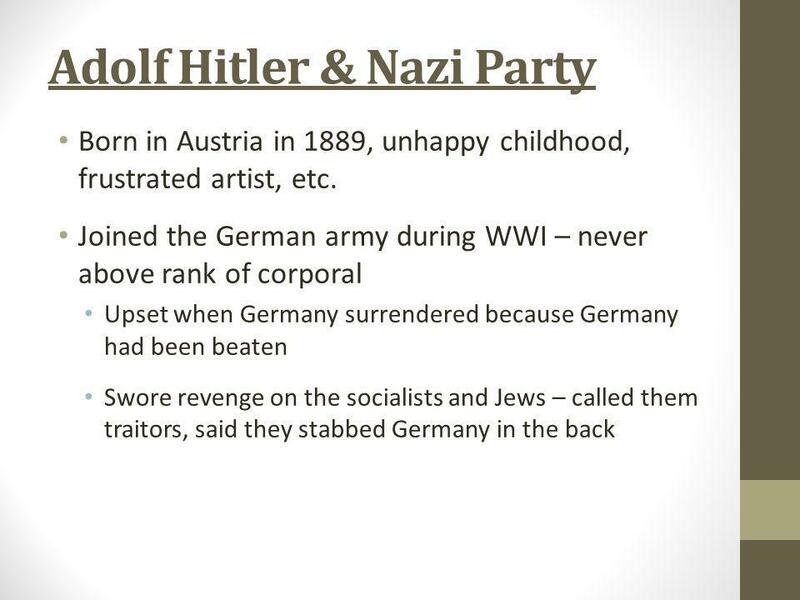 About 2 ½ million Germans lost their lives. 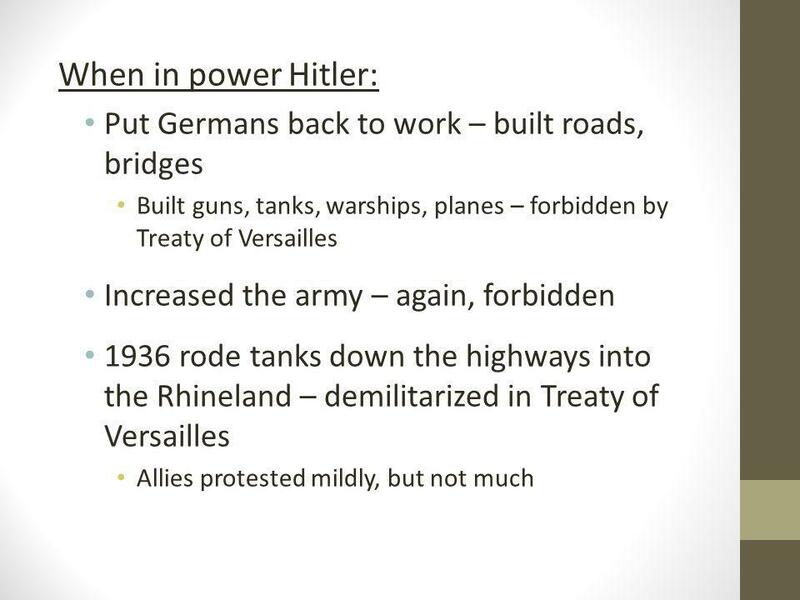 Main Causes of World War Two 1.Treaty of Versailles 2.Economic Conditions 3.Rise of Fascism/Dictatorships – Hitler, Mussolini and friends 4.Failure of.